It has been a fun summer. 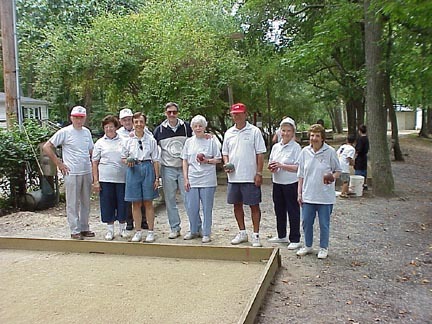 We had a most enjoyable Bocce Season, thanks to Mary Ann Vergulti and all the players. 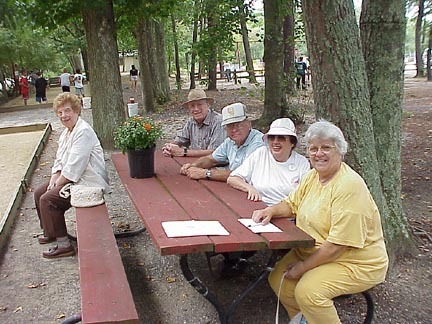 This is a reminder to all our members: The Norma Team, our Annual Tournament winners, will put on a demonstration of Bocce on Saturday, September 9, at the Old Fashioned Family Fest at Birch Grove Park in Northfield. Word has been received that they will go on at 11:00 A.M. I urge all our Bocce players to try to be there. What a great opportunity this will be for us to turn up in numbers and advertise our Lodge, especially if we wear our Bocce shirts or Sons of Italy shirts! Mille grazie to Franz Bohle, for the incredible job he did in rescheduling our Gala Italian Night at the Sand Castle to Friday, August 25. It turned out to be a beautiful evening, the weather was perfect, our State Grand Lodge President James J. Daloisio, Esq., threw out the first ball, and to add to the festivities, Robert Polillo, locally well-known musician and tenor, sang the Italian National Anthem. Bravo! Again, mille grazie to Nina Giacona and Gene Compton for giving us an outstanding new Lodge Directory. If any of you have not already read the article they included about Antonio Meucci, for whom our Lodge is named, believe me, you will find it extremely informative. I especially want to invite those members, who haven’t been out to our meetings recently, to join us at our September Social. Come and enjoy the good food and the warm camaraderie. Benvenuti. FRIDAY, SEPT. 15 - 6:30 P.M. September Social, followed by Regular Meeting, Good Shepherd United Methodist Church, Northfield Bring your appetite and your favorite dish! $3.00 per member -- $5.00 per non-member. EXTRA! EXTRA! As a result of careful consideration and review of our Lodge’s finances, a motion was duly passed at our last Regular Meeting (August 18), whereby our annual dues were increased $5.00 from $25 to $30, beginning January 2001, with the proviso that if things regarding revenue do not improve by the following year, they will be increased another $5.00, from $30 to $35, beginning January 2002. 1. Casino bus night trip -- He reported that the Showboat and the Hilton seem to be the only ones that will accept us for the 4 hours, 6 to 10 P.M. If we can get 49 people for each trip @ $10 each, less the $195 for the bus, we could realize about $300 for the Lodge each trip. Trips are for anyone, not just Lodge members. Keep informed for time and place. 2. Raffle for trip to Italy for a couple -- Sal is working on the permit for the raffle. He has chosen a 10-day trip to Italy with 2 reserved airplane seats leaving April 1, 2001, from Newark Airport. Each raffle ticket will cost $50, good for a couple. Only 200 tickets will be sold. He said that even if we sell only 100 tickets, we could make $500 for the Lodge. More info to come. Many of you already know that the first President of our Lodge (1988-1990), Frank DeFeo, has moved to Delaware. His leaving the area unfortunately left a vacancy on our Board as a Trustee. Mario Martirone was duly elected to fill that vacancy. Buona fortuna, Mario, and mille grazie, Frank, for all you have done for our Lodge. We wish you and the family our warmest best wishes, and we’ll send you Novelle, as you requested. Mary Ann Vergulti thanked everybody who participated to make our Annual Bocce Tournament such a notable success on Sunday, July 30. She brought a VCR tape of the segment that Channel 40 aired of the game that evening so that members could view it after the August meeting. Don’t delay to call Ron Sulpizi if you’re interested in joining the UNICO - Great Atlantic City Chapter 1st Annual Bocce Tournament in Margate, Saturday, September 16 . There is a deadline to submit forms. SATURDAY, SEPT. 9 -- 11 A.M. 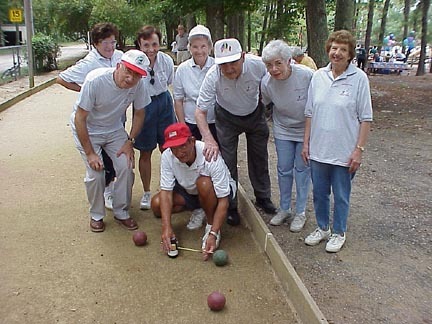 The Norma Team will give a Bocce demonstration at the Old Fashioned Family Fest at Birch Grove Park in Northfield. Please come -- and wear your Bocce or Sons of Italy T-shirts! MONDAY, DECEMBER 11 -- Christmas Party It’s firm! OCTOBER IS ITALIAN-AMERICAN HERITAGE MONTH. CELEBRATE IT! This issue marks one full year of Novelle. Mille grazie to all who cooperated in meeting deadlines and contributed personal memories and stories, BUT ESPECIALLY to Angie Martirone for her diligence in running off copies and mailing it on time! Success does not happen by accident. Italy is smaller in size than California, but it still makes more wine than any other country -- a quarter of the world’s supply, according to Investor’s Business Daily, a newspaper in Los Angeles, California. Italy has been declared the world’s fifth largest industrial power. In Catania, Sicily, more than 2,000 people have recently become millionaires playing the stock market. Italy’s Premier Massimo D’Alema has six women ministers in his government. Some places in the north of Italy have as high a standard of living as elsewhere in Europe. In Italy it is against the law to make or receive a telephone call while driving a car. Why can’t we be that smart here. The Italian Hospital Society was founded in 1937 with the purpose of serving the Italian-American community with humanitarian and cultural goals. It has guided foreign medical graduates, given scholarships in the field of health services, and intervened to provide help to immigrants in search of a better lifestyle. They are committed to the creation of the Italian Homes for the Aged in New York City. In Italy, about 10% of the Italian people are not Catholics. The Protestant population is concentrated in the far northern regions. The largest are the Waldensians. In recent time, Evangelicals have sprung up as well as other Protestant denominations. People of Jewish faith number around 55,000 and have lived in Italy since Roman Empire times. The Greek Orthodox have an Archbishop and there are small settlements in southern Italy. Today, there are a number of immigrants who are Muslims. There are other religious groups, but many are small. Italy and Spain have the lowest birthrates in Western Europe, an average of 1.2 children per woman. Why? State aid to families with children is lower in Italy than other Western nations. Italian women work and Italian men have generally failed to take on their proper responsibilities. The mammoni are some who remain dependent on their mothers and never marry. And for the ladies, spinsterhood does not carry any stigma. Zero growth for Italy will cause many problems! After 38 years of marriage, Luciano and Adna Pavarotti are apparently going to officially go their separate ways. They recently appeared in court for one last effort to reconcile. Pavarotti has been living with his much younger former secretary. Reaching a financial statement with Adna is the next step in the Italian legal process. Chi parla assai fa sputazza. He who talks too much creates a lot of spit.